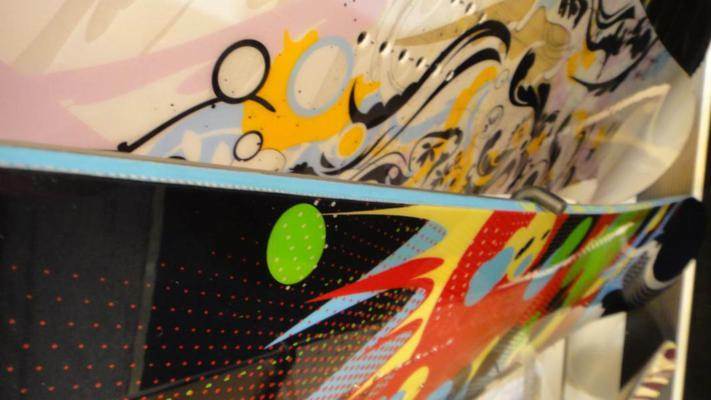 The Rossignol Justice has two things going on with its camber profile. There is a mellow camber underfoot but also a lifted edge all the way around the board. Then to compensate for the lifted edges it has Rossignol’s most aggressive magnatraction on the sidecut. This makes for a very different ride underfoot. It feels like its a typical Rossignol hybrid camber board underfoot when one footing or flat basing until you try to find your edge. Then it takes a lot longer for you to find it and it can make the board feel washy. The plus side of this is you can jib and butter without worrying about catching edges but it definitely is a different feel on the mountain that takes a lot of getting used to. Conditions: Pretty good spring conditions. The Rossignol Justice is a good do everything kind of ride that does everything well. The only real complaint we have about the mini camber between the feet is that your Ollie power is not the best. It does makes for stability in hard pack, flat basing and lets you explore most places in the mountain and park. Not much has changed for 2011 so if you find 2010 model’s it isn’t a bad choice. For 2012 the justice has some new colors but the ride is pretty similar to the 2010. Same for 2013 and 2014. Just a few minor tweaks but the ride is the same. Other than that the Rossignol Justice is a good all condition single board solution for the more consistent rider that doesn’t want a quiver. Powder: The Justice has a good amount of rocker that starts about the mid part of the bindings. The float is pretty good when it comes to riding powder. Especially for a directional twin. We have to say we’d like to see a bit more of a setback to give it a little bit more of a surfy style with more of a float than what it has now. It’s kind of in between a freestyle centered board and a surfy set back all mountain board. Turn Initiation– To some this board might take more work but to us it was pretty easy. It was very easy to make short quick turns and then make longer carving turns. Our one complaint is if you come from a camber board or a hybird Rocker board you might feel the Justice to be a bit hookey at first. After a few runs you get use to it but we feel it should be mentioned. Speed: The Rossignol Justice has good speed for it’s flex and design but when going into a long straight line you can feel a little bit of chatter. It’s nothing unbearable but it is noticeable. If you are looking for a bomber board this isn’t it but it’s great at medium speeds. Uneven Terrain: Not bad but not great in bumpy snow. It’s good getting around bumps and ruts in crowded end of the day snow but it’s a little tough going over small bumps, crud and such. Approximate Weight– The Justice is well built and looks pretty sturdy. That being said it’s not heavy either. It’s light. Edge Hold: The hybrid camber in the Justice seems to help it grip the snow between the feet very well. It does a great job climbing up a icy pipe wall but after a few weeks of hard pack conditions and some times snowment we found it not as grippy as let’s say a magnetraction board but it still did a pretty good job in just about anything you would want to ride from the Rocky’s and west. 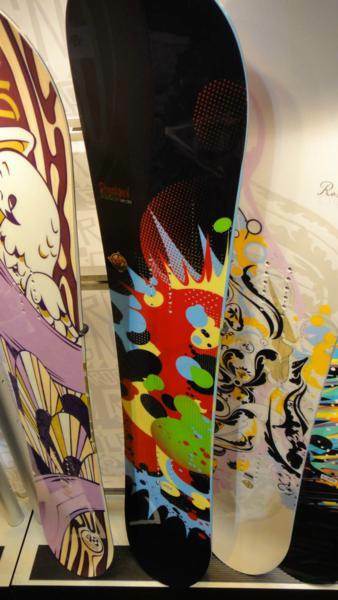 East coast riding in ice and snowment might not be the best choice compared to the Rossignol Diva . 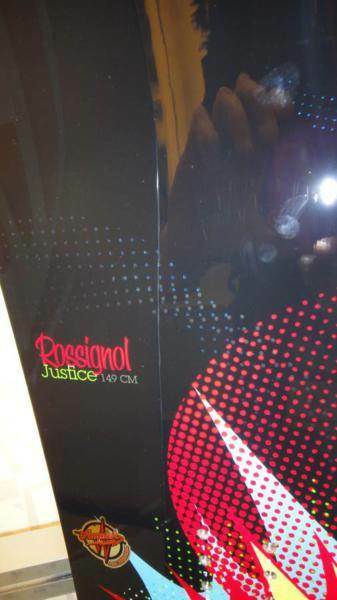 Flex: As you can see from the Rossignol Spec sheet is the Justice has a different flex throughout the board. We would still call this a medium flex. Despite it’s medium flex (stiffer in the middle it still has a playful feel that makes is feel like you are riding a soft board. It’s not going to butter very well but it will do better than you would think. Carving– Do everything boards like the Rossignol Justice aren’t going to carve like the Rome Blue. That being said if you feel like you want to lean all the way into a turn then the Justice will do a good job getting you close to the snow and doesn’t wash out that easy. Switch: We rode the Justice with a centered stance and despite the directional twin shape and varied stiffness throughout the board the Justice rode switch just like we were riding regular. None of us noticed a difference. Jibbing– This would be a shame to ruin those perfect edges and ride this board over kinked rails. This is more for riding the mountain, stopping to hit some jumps and then making a run through the pipe. It can jib ok but you would be happier on softer boards. Pipe: Really fun and forgiving in the pipe. The edge hold is there and the Justice is forgiving enough to try new things. Jumps: The Justice is pretty springy and lively. It’s a lot of fun to generate your own air or go off a kicker in the park. We don’t go big at the Good Ride but we can see this has potential for those that like the pro size park. If you aren’t all about that it will be fun in the medium to small size kicker range as well. We know the Rossignol Justice isn’t the first board to come up when you think about the best of the best to buy but we feel Rossi’s mostly rocker hybrid camber and all around design has some serious merit. Also The Justice makes for a great all conditions ride that most will enjoy. We love the stable feeling between the feet and feel this is an excellent all mountain freestyle board. It’s definitely one of the top choices when looking for a new ride. We try to get as many images of the Rossignol Justice, but forgive us if they're not all there.